I’ve been meaning to go to IconPark for some time, and when I saw an advert for a $20 BBQ platter event this past Sunday at the current Rupert and Ruby’s pop-up, I knew it was time to pop my IconPark cherry. Bar stools awaiting the flood of hungry patrons that flock to Rupert and Ruby’s. Service: It seemed like there was one waitstaff for every two diners. The staff were, without exception, attentive, friendly and efficient. When asked about what other tasty dish we should order to go along with our BBQ platter, they enthusiastically made recommendations for the chicken and waffle dish. Who were we to say no? Food: First, the BBQ platter. 16-hour smoked brisket, pulled pork with South Carolina yellow mustard BBQ sauce, fried chicken tossed in honey butter, slaw and jalapeño cornbread. The actual plate it was served on – super cool! I felt like I was back in 1986 eating lunch at my Grandma’s house. Brisket: Incredible. Perfectly cooked (clearly low and slow), with a peppery rub. Deliciously moist, juicy and tender. Yum. Bravo, Rupert and Ruby’s. Pulled pork: This was some of the best pulled pork I’ve had in Sydney, or anywhere, for that matter. The meat was again flavorful, juicy and tender. The highlight was the “Carolina” BBQ sauce. American barbecue sauce differs by region. In South Carolina, where I lived for a year, they use a yellow-mustard-based sauce. 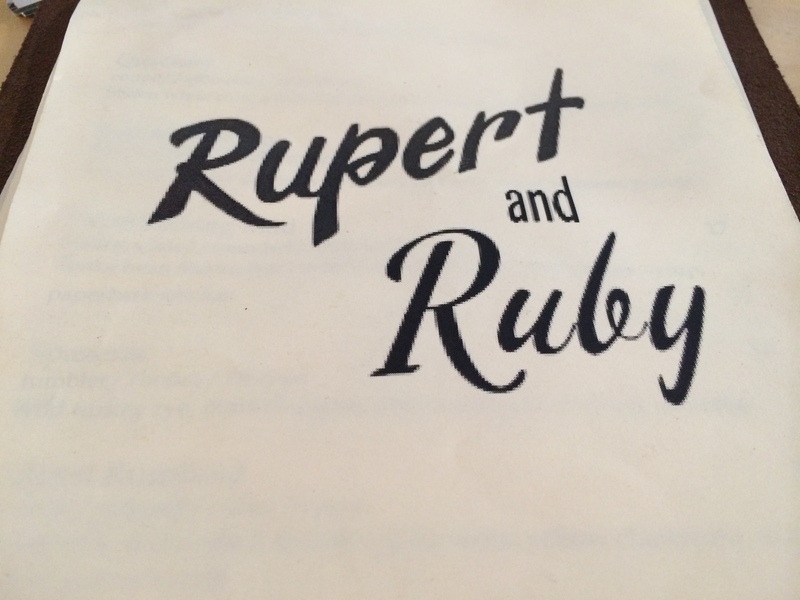 Rupert and Ruby’s sauce was better than any I ever had in South Carolina – the mustard can make the sauce overly sharp but at R&R the sauce was smooth and slightly sweet. Divine. Fried chicken: The R&R website describe their fried chicken as being tossed in honey butter. It was pretty tasty, but (as is my long-time lament with Aussie coated chicken wings) I felt the sauce made the fried chicken a bit soggy, being a crispy skin fan. It was still good though. ‘Slaw: The veggies were crunchy and fresh, with just the right amount of tangy dressing. I personally like my ‘slaw a little on the sweet side, but again, that’s a matter of personal taste. Next up: Phil’s dish of chicken and waffles. 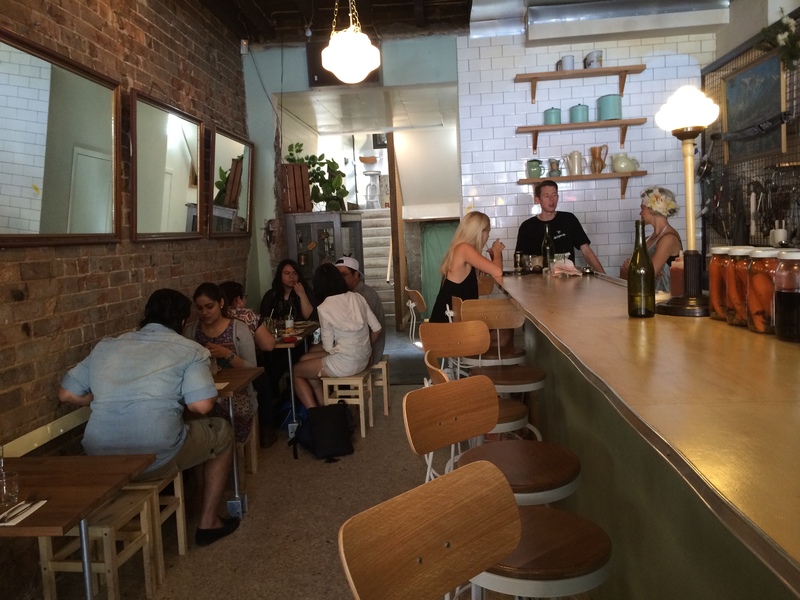 Southern-style fried chicken, Sydney’s tastiest waffle, hickory-smoked ice cream, honey butter. 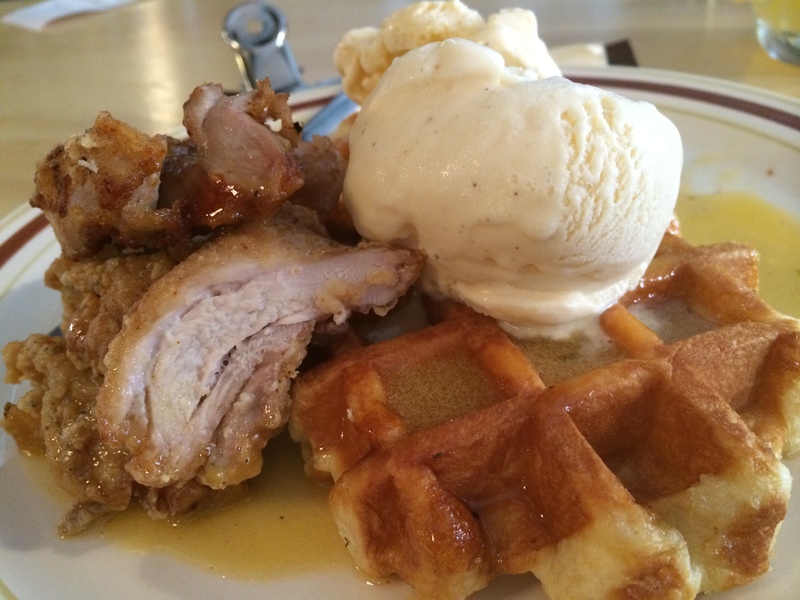 Chicken and waffles could almost be singularly blamed for America’s obesity problem. 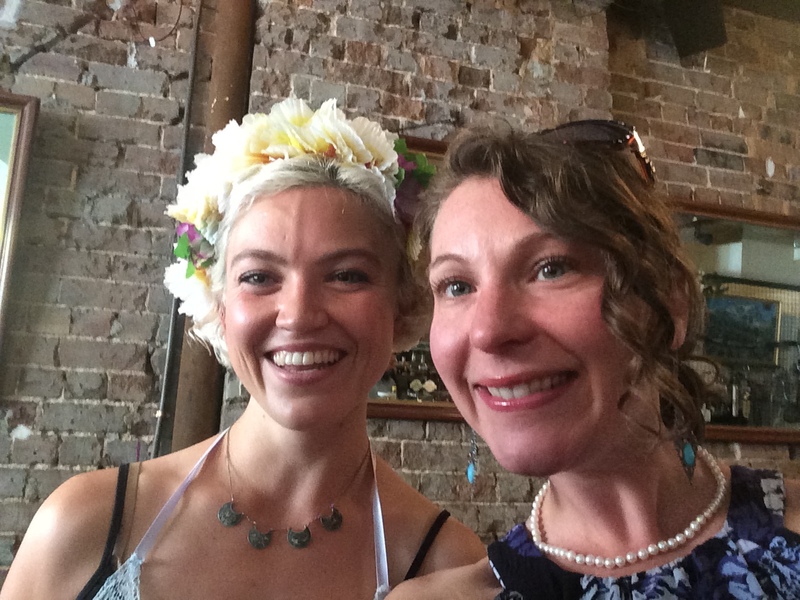 (I’m a dietitian – I know these things.) Artery-clogging properties aside, chicken and waffles is a very popular soul-food, sweet-salty Southern combo. Fried chicken: Incredible. Southern flava in every bite. The skin was absolutely spot-on crispy and delicious, the meat juicy and tender. The honey butter was pooled at the bottom of the dish, letting the crispy skin come through in all its yummy crispy glory and offering maximum mop-up sauciness. Waffle: Being a Yank makes me a slight connoisseur and seriously, this was one of the BEST waffles I have EVER eaten. It was dense and almost cake-like, with a donut-esque flavour. On occasion, I would crunch down on something I first thought was an ice crystal in the ice-cream, but happily discovered they were actually caramelised sugary bits! Bliss. Ice-cream: No hickory-smoked flavour was detected, but to be honest, the fried-chicken-honey-butter-waffle combo was so unbelievably delicious the ice-cream was almost an after-thought. 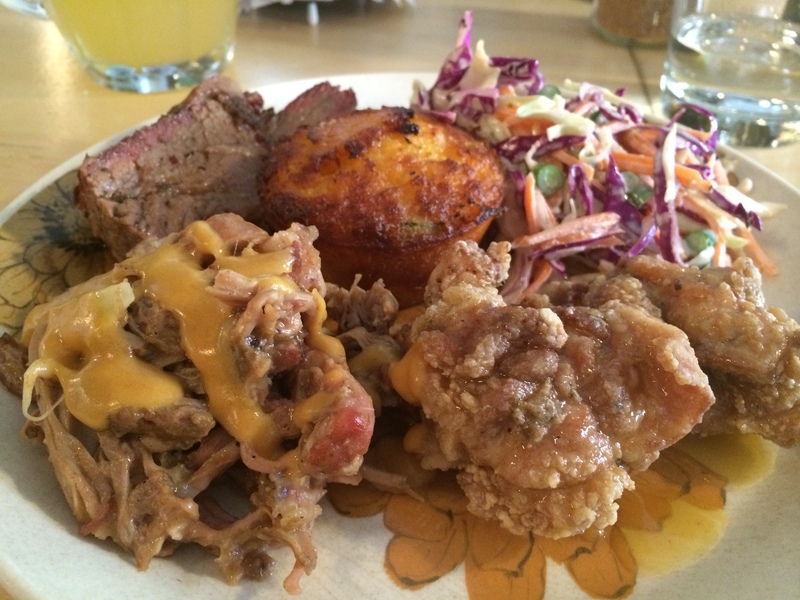 Value for Money: The BBQ platter and the chicken and waffles, both $20, were worth the money. The Young Henry pints ($13 for a cider?!) were not. I’m getting used to the exhorbitant-to-the-point-of-being-silly price of beer in Aussie, but really, should beer cost that much when it’s brewed mere kilometres away? 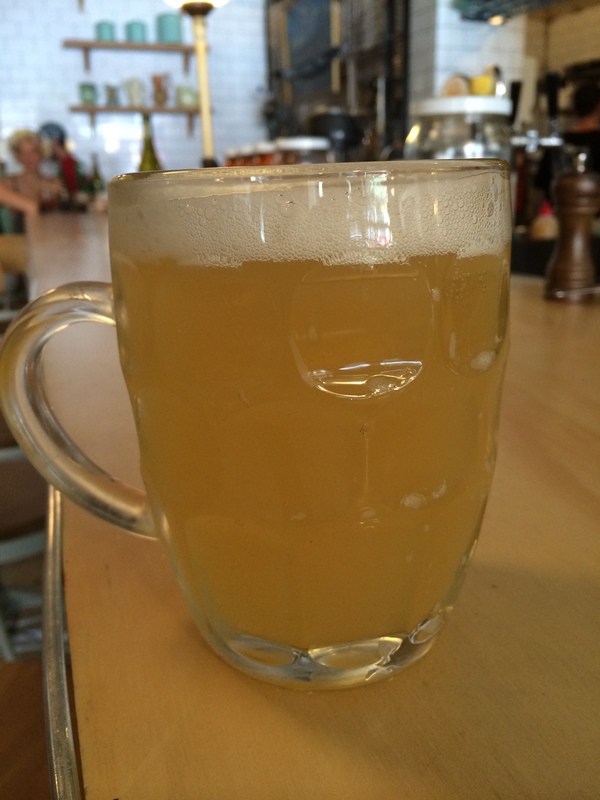 Surely domestic craft beer should be cheaper than foreign, imported grog? To sum up: an excellent dining experience. Great service, homey, folksy ambiance, excellent food, and decent value for money, for the food at least. We’ll be back! oh my! that fried chicken and waffles look insane! It was so good! Is there anywhere else in Sydney doing chicken and waffles like this?